I captured this close-up image of a Barn Swallow (Hirundo rustica) as it rested on a perch a short distance from the location of its nest, underneath a raised portion of the boardwalk at my local marshland park. I have posted a number of close-up shots of Barn Swallows in the last few weeks (including one that I entitled Too Close), but this one is distinctive for a couple of reasons. 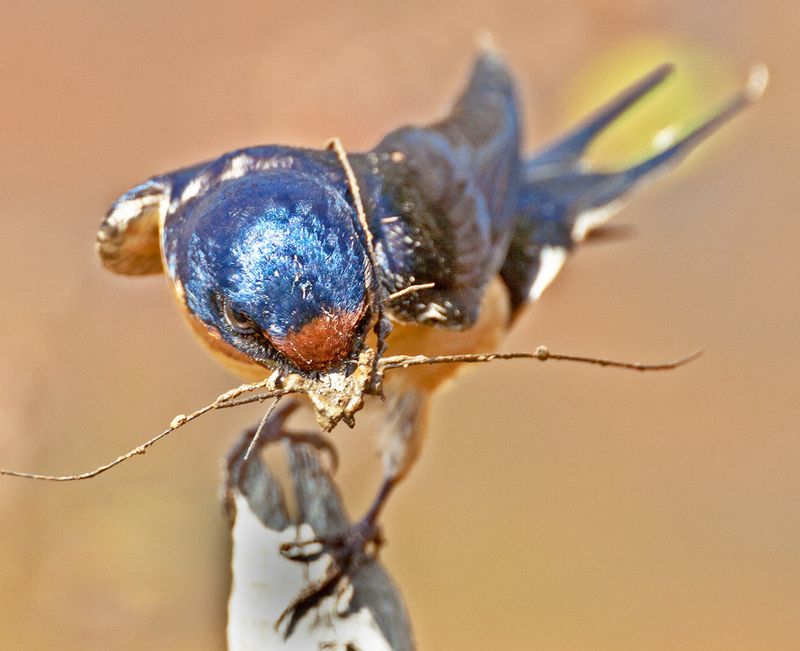 The swallow is in the midst of working on its nest, and the mud and twigs in its bill show clearly its primary building materials. Most of my other photos have showed a swallow posing as it took a break from chasing insects. The other notable feature of this image that I really like is its narrow depth of field. Although I included the sparrow’s entire body in the shot, only a small part of it is in sharp focus, essentially the forward half of its head, including the one visible eye. I think that the limited area of sharp focus really helps to draw attention to the eye and to the muddy bill.